Catholic News Service presents a series of columns in the wake of the recent national elections on key issues facing the church and the new Trump administration. In my Labor Day statement this year, I highlighted the plight of millions of Americans who face twin crises — deep trials in both the world of work and the state of the family. In many ways, the recent election results are connected to working-class communities beset by these factors, and that feel abandoned and unheeded. Wages are stagnant for many. Multiple part-time jobs are an all-too-common reality. Cities and towns in parts of our country have gone for decades without a revival of stable work capable of supporting a family. The resulting poverty is different than many have endured in the recent past. The promise of better things to come is now a rare topic of conversation around the dinner table; in fact, countless families no longer gather together around the table at all. Financial concerns and breakdowns in family life can lead to a sense of hopelessness and despair. The Rust Belt region now appears to have the highest concentration in the nation of drug-related deaths, including overdoses of heroin and prescription drugs. Suicide rates indicate a loss of hope for many, and too many young people in particular. President-elect Donald Trump spoke a good deal about economic revival during the campaign. He appears unconcerned about whether or not his unorthodox methods will please the pundits. This creates both an opportunity and a challenge. Those who contributed to his election are placing a lot of faith in the president-elect to deliver on his economic promises. We should learn from the pain of our forgotten communities and give President Trump a chance to do as much as possible to open doors to a new economic future. But here’s the rub: Any approach toward job creation and economic revival must be undertaken with the sister principles of solidarity and subsidiarity in mind. The principle of subsidiarity recognizes that issues facing human beings should be addressed at the appropriate level of society, and often in concert with others. Solidarity recognizes that each of us is connected and that we all have the responsibility to care for one another, particularly those who are poor and vulnerable. As the Catholic Church teaches and Christ demonstrated, our human dignity is deeply connected to dignified work, work that makes possible a healthy family life. Subsidiarity urges that a much larger conversation ought to be set in motion at this moment — industry, government and the faith community have an obligation to look at ways in which our economic, political and legal structures hamper family support and formation. We must discuss just wages (not just the minimum wage) and undertake a national examination of conscience, honestly assessing where we can improve and collaborate in supporting policies and practices that empower and sustain family life, and thereby rebuild the economic life of our nation. Recent years have been permeated with a sense of pitting institutions of government and civil society against one another. Instead, we ought to see what can be done when we try a different approach, one built on mutual trust and respect, and the realization that every segment of society is necessary in the heavy lift before us. This safety net is an important piece of the moral equation. Society has a responsibility to help meet the needs of those who cannot care for themselves, who cannot work or whose work is caring for young children or disabled family members. Assistance to get families back on their feet is a wise long-term investment too. Our policies, even in the area of job creation, cannot sweep these needs aside. Faith communities have an important role to play, but we cannot do it alone. America can lift working-class families out of poverty with good jobs and support those who are struggling at the same time. In fact, if we wish to give more than false hope to those who feel most abandoned by Washington and build toward lasting change, we must do both and do it together. 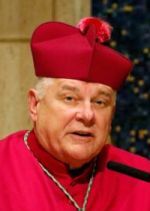 Archbishop Thomas Wenski is Archbishop of Miami and chairman of the U.S. Conference of Catholic Bishops Committee on Domestic Justice and Human Development. For you to cloak protection of the safety net in the words of Ronald Reagan, of all modern Presidents, is the epitome of chutzpah. The man who did more to demonize the poor than any modern President. Your partisanship is showing, Bishop.